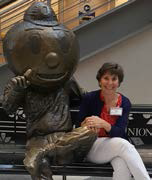 It is a great pleasure to join The Ohio State University as a Community Development Educator! In this, my first blog for OSU Extension, I will share a little bit about my background, my specialties, and what I hope to achieve in this exciting role. My career has spanned over 30 years with almost as many twists and turns. I have worked in higher education in Alumni and Development at North Central College, Naperville, Illinois, and Stanford University Law School, Palo Alto, California, as well as Kent State University in Community Outreach. For several years I worked with my husband building his manufacturers rep business. Most of my career has been dedicated to sales and marketing. My experience includes sales and marketing of products and services in healthcare, education, and technology for manufacturers and distributors in territories spanning the United States. I have been honored to earn sales awards, including Presidents Club and Rookie of the Year. I am drawn to the challenge of learning, researching, planning, and executing. Beyond planning, I am skilled in training, product launches, and event planning. At McDonalds Corp, as a Business Consultant to franchise owners, I gained the utmost respect for the business acumen, planning, and work ethic of those owners, their managers, and the entire staff. During leadership training at Hamburger University in Oakbrook Illinois, I was awarded the Gold Hat Award for Leadership by my classmates. This honor is bestowed on one class member who personifies qualities of leadership and character. As a member of the Ohio State University Extension Office in Medina, I will contribute my experience, dedication, and skills in planning, discovery, and continuous improvement to assist the community, businesses, and government in efforts that improve the quality of life in Medina County. I have lived, worked, volunteered, and raised my family in Medina County for over 30 years and I am a northeast Ohio native. This county is my home and community service is my passion. In the weeks and months to come, I am looking forward to digging in and contributing my skill, resourcefulness and energy to projects that will result in valuable outcomes for county residents. I invite you to join me! Please reach out to me with your ideas, challenges, and dreams! I can be contacted by e-mail at white.2811@osu.edu, or follow me on twitter @OSUXTBucKyle. Kyle White is the County Extension Educator for Community Development in Medina County (Western Reserve EERA). 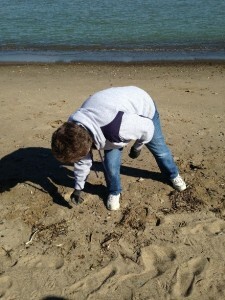 I love going to the beach to swim, paddle, or chill out, but my recent visits to the beach have begun to look different. I notice more trash and it’s gross. It could be my increased awareness as a result of my work in the field of marine debris, but I think it is a result of more “single-use stuff” being purchased and then improperly disposed. Most of what is found along beach cleanups is single-use, mostly plastic, items. 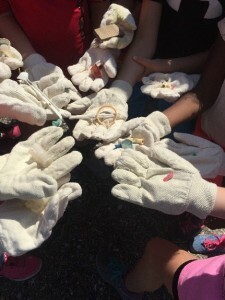 Common marine debris items include cigarettes, straws, and plastic bottle caps. Reducing beach aesthetics, making a beach visit less pleasant or reducing the number of tourists coming to our beaches. Causing dangerous and costly-to-fix boating situations when boat propellers become entangled in rope or other debris. Harming human health through leaching of toxic chemicals as plastics degrade. Entangling other animals or hurting animals that mistake trash for food. Spitting the straw out! Kindly refuse single-use plastic items such as straws or silverware when away from home. Using reusable! Bring a reusable bag when you go shopping for food, clothes, or other items. Also bring a reusable water bottle with you. Ohio generally has lovely tasting tap water and it’s much cheaper than buying bottled water. Covering up! Make sure trash cans and recycling bins are covered to avoid wind or critters taking your trash somewhere it doesn’t belong. Flicking it right! Smoking items are the #1 item found on beach cleanups around the world. Cigarettes have plastic in them, so they never truly disappear when they get in the natural environment. They degrade into smaller fibers of plastic. Use an ash tray or smoking receptacle to avoid littering. Stinking it up! Synthetic clothing such as fleece shed fibers through wear and tear and especially through washing. You can choose to wash less or invest in a microfiber catcher. Jill Bartolotta is an Extension Educator with the Ohio Sea Grant College Program. marine debris: NOAA marine debris program. 2016. Website: https://marinedebris.noaa.gov/. 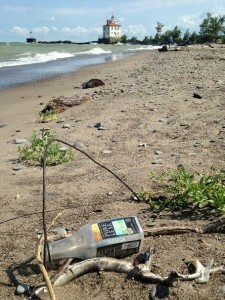 Adopt-a-Beach: Alliance for the Great Lakes, Adope-a-Beach. 2016. Website: http://www.greatlakesadopt.org/?gclid=CIfZidjT4c0CFQiQaQodl4UKJQ. microfiber catcher: Rozalia Project. 2016. Website: http://rozaliaproject.org/stop-microfiber-pollution/. As you think about the question, take a few minutes to reflect on your career and the learning events you have led. What were your expectations of the learner and how did you assist them in applying what they learned? What kind of structure needed to be in place? What resources were needed (time, tools, etc.)? What worked? What didn’t work? What barriers interfered with the follow-up? Reflecting on my career, I see my approach to learning has changed over time. Early on, my approach was more informal, less-structured, and guided by very little in the way of lesson plans. It was a more intuitive and “Just-In-Time” approach to instruction. As I moved up the ladder, my approach evolved to that of a coach. I’d share a few of my experiences, question them, and then call them to action at the end….not telling them what to do per se, but rather aiming to trigger their thoughts about how they might do things differently. Now that I am in the business of education/training, everything about my approach is more formal, structured, planned, written and timed out, with reinforcement and coaching throughout and after the event. When it comes to training others, first and foremost I focus on enabling the learner to apply what they learned as quickly as possible. With interpersonal skills, for example, I remember acting as a “champion” for 14 managers/ supervisors after the learning event to coach them on using the tools presented in the class to successfully apply what they learned. In summary, both remembering and applying are important: remembering the material is required to repeatedly apply what has been learned, and this enables mastery of the new skill or knowledge on the job. You may want to do a self-assessment as a learning leader. In thinking about your most recent programming efforts, to what degree have you engaged participants in a timely follow-up/support/evaluation? Do you follow a Standard Operating Procedure to assess the degree to which your learners are remembering… and applying? Frank Gibson is a Program Manager with OSU’s Alber Enterprise Center. In my recent blog post on Global Warming and Uncertainty, which you can read here, I explained that, although carbon dioxide (CO2) is the main driver behind human-induced global warming, feedbacks will ultimately determine how much the global temperature increases. If you are unfamiliar with the concept of feedback and how it relates to global warming, I suggest you read that earlier blog before continuing here. Many climate models show that, although the effect of a doubling of CO2 concentrations in the atmosphere from the pre-industrial level of 280 parts per million (ppm) to 560 ppm will cause a temperature increase of somewhere between 3.5 and 8.1 degrees F, only a portion of that (about 2-3 degrees F) can be directly attributed to CO2 itself. The extra temperature rise is due to how the models calculate feedback. Those who say that temperatures will rise by less than 2-3 degrees F are arguing that Earth’s climate engine has negative feedbacks built into it which will prevent the initial effects of CO2 warming from being amplified. At this point, it is very difficult for either side to “prove” whether the feedbacks will be positive, leading to more warming, or negative, leading to less warming. So we are left with hypotheses, or educated guesses. I have studied the literature carefully, and I personally believe that positive feedbacks will rule the roost, leading to an amplified warming. Let me give you some of my reasons. The primary feedback from an initial warming caused by an increase in CO2 is increased evaporation from the oceans, which adds water vapor (H2O) to the atmosphere. But water vapor is a greenhouse gas, so this leads to more warming. The extent of this warming is unclear, primarily because water vapor gathers in the form of clouds, and clouds themselves have an ambiguous effect in terms of feedback. On the one hand, since their tops are white, clouds tend to reflect solar radiation back to space. This is a negative feedback, preventing warming of the atmosphere. On the other hand, clouds hold heat in near Earth’s surface, especially at night, leading to more warming – a positive feedback. Those who expect that the negative feedback from clouds will prevail are making a very large assumption, particularly since we already know that the presence of water vapor in the atmosphere leads to increased warming. So while I am not denying that an element of negative feedback exists, I am just not convinced that it will equal or exceed the other positive elements. The other major feedbacks, similar to the case of clouds, involve changing color – this time of Earth’s surface itself. Since the initial effect of CO2 is warming, we are witnessing the retreat of glaciers, sea ice and snowpacks, particularly in the northern hemisphere. This leaves a darker surface, both at sea (dark blue) and on land (mostly green and brown). Replacement of white surface with dark water and land reduces the amount of solar radiation that reflects back into space, and causes a great deal more heat to be absorbed on Earth’s surface. I think it is hard to overstate the importance of this phenomenon, especially since it played such an important role at both ends of previous ice ages. As more snow piled up due to initial cooling caused by changes in Earth’s orbit, the colder Earth became, leading to ice ages. 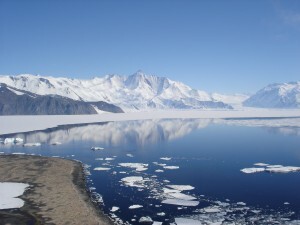 As snow receded near the end of the ice ages, more dark surface was exposed to the sun, allowing for an acceleration of the warming that led to the climate we have today. So there you have it. If the doubling of CO2 itself without feedbacks is expected to increase global temperatures by about 2-3 degrees F from pre-industrial levels by 2100, it looks to me like we can expect an overall warming of greater than 3 degrees. Some climate models put that number at about 8.1 degrees F, a warming that would completely transform Earth in ways that can only be described as catastrophic. But then again, perhaps the positive feedbacks, even though they do rule the roost, will not lead to that much warming. In fact, up until now climate models have tended to over-predict the increase in global temperatures by about 30-40 percent, possibly because they do not sufficiently account for some negative feedback. Given all these factors, my best estimate for a doubling of CO2 by 2100 is about 4 degrees F. This will mean a climate warmer than any Earth has seen in the last 7 million years, a period far longer than humans have been around. At a minimum, the challenges our descendants will face from this will be enormous. But there is still time to take action to prevent a doubling of CO2 from occurring. That presents an enormous challenge to US. 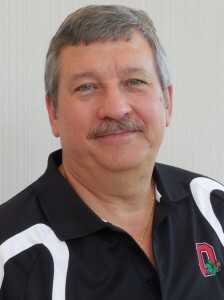 Tom Blaine is an Associate Professor with OSU Extension, Community Development. Feel free to contact him to present a global warming update to your group.